feeling ko nagiging parang pc na ang consoles. sana resolution upgrade lang. ...pag yung rumor na yung bagong nintendo console babalik sa cartridge format na wala nang loading times, baka sila na naman sumikat. Di na ganun kaganda ang disc eh. Speaking on Twitter, however, Xbox head Phil Spencer put an end to that speculation once and for all by recommitting to a 6TFLOP GPU, and confirming that Microsoft’s plans have not changed since the initial announcement for the console. 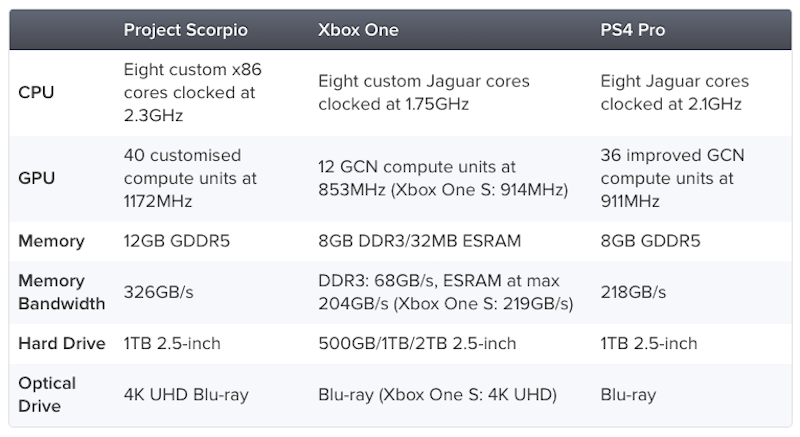 This means that as of right now, the Xbox One Scorpio is still slated to be the most powerful console ever created when it launches next year- though at the same time, the question of whether or not that power will amount to anything, given that it will never have true exclusives, and always have to maintain parity with Xbox One, is something that remains to be seen. Miicrosoft will finally unveil Project Scorpio this Thursday, April 6th at 9:00 a.m. EST/ 2:00 p.m. UK. ^same games lang daw ng xbone to di daw magkakaroon ng exclusive sabi ng MS.
tsaka duda ako sa move ng MS for announcing this early - either they're too confident or too desperate na. ...may mga games nang pinakita? ^Forza lang from digital foundry. Siguro if uncancelled yung scalebound may chance pa siguro. parang nagiging trying hard ang MS sa Scorpio para palakasin ang performance. ang laki ng heatsink. baka mag balik ang 3rl. wala ding ka appeal appeal sa akin ang console na ito. no reason to buy if you're a pc gamer. tsaka isa lang naman ang importante sa gamers eh - its the software. Ganda nga ng hardware pero wala ka naman malarong astig wala din. Wala bang exclusives or multiplat title na lalabas when scorpio launches? Dont most new titles also launch during the holidays?